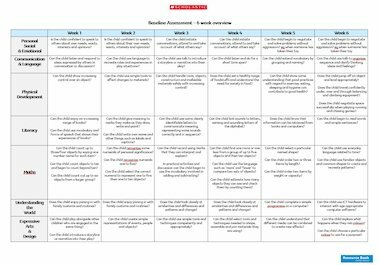 This six week template breaks down learning outcomes into manageable chunks week by week to ensure that your baseline assessment covers each area of learning and the strands within them over the six week period. This can be used for each child and space is provided to record observations. To make collaborating your data more manageable when looking back at your observations, you will be able to highlight whether each child is Emerging, Developing or Secure in this strand.